Claremont Police Chief Alexander Scott announced on Tuesday that Claremont Police Department (CPD) has earned reaccreditation by C.A.L.E.A. (Commission on Accreditation for Law Enforcement Agencies). The department received its reaccreditation after a formal hearing on November 21 in Miami, Florida. 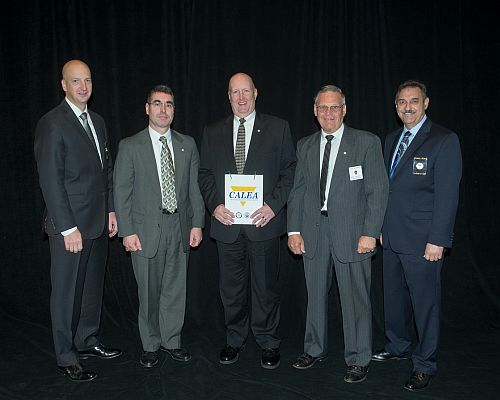 The re accreditation makes Claremont one of 12 police departments in NH and in the one percent of all of the police departments in the US that meets the CALEA gold standard for public safety. In June, the assessment team from CALEA spent three days at CPD and in the community conducting interviews with elected officials, the City Manager, department staff, and community members. They also reviewed written materials and examined policies, procedures, and operational protocols across the full spectrum of departmental activities, and included ride-alongs with officers in the field to verify that policies and procedures were actually in practice. A small group of protesters were in Claremont’s Broad St. Park Tuesday afternoon calling for Justice for Hope. Hope is the abandoned Pit Bull found near death in Claremont last month and is recovering at Lost My Way Animal Shelter. Claremont Police have been investigating the case for possible animal abuse but no charges have been brought forward. Claremont Police Chief Alex Scott said the investigation is still ongoing and they will make the outcome of the investigation known upon its completion. Protesters said they would gather again at 11:00 am on Saturday. A Charlestown NH teen took first place in the VFW District 2 – Voice of Democracy Scholarship Program. VFW 8497 and it’s Auxiliary in Charlestown sponsored Patrick Moody for the scholarship. The Voice of Democracy program requires entrants to write and record a three- to five-minute script on a patriotic theme. “My Vision for America” was this year’s theme. Patrick competed with 34 other students from Fall Mountain Regional High School. Patrick will move on to represent District 2 with Posts in Charlestown, Claremont, West Lebanon, and North Haverhill, at the Department level. An award ceremony for all seven-district winners will be on January 23, 2016 at the Best Western Executive Court Inn, in Manchester. The first place winner at Department receives a $1500 scholarship, 2nd – $1000, 3rd $500, and four honorable mentions $200 each. The first place winner goes on to represent the State of New Hampshire in Washington, D.C. for the National contest. Springfield VT Man Charged with Voyeurism. A Springfield VT man was arrested for Voyeurism. Police say that Douglas Guy allegedly uploaded explicit images to the internet of a person without their consent of being photographed or video tapped. Guy was cited to appear in Windsor County Superior Court, Criminal Division on December 22, 2015.